Even pets were not immune to the comic-book ads and there were quite a few different ones, whether it was the now famous sea monkeys, or squirrel monkeys (which were a real con, because you actually did get nothing for your money). As with other items that were advertised, they were sold as wonderful exotic things, when they were really quite mundane (sea monkeys were just brine shrimp). 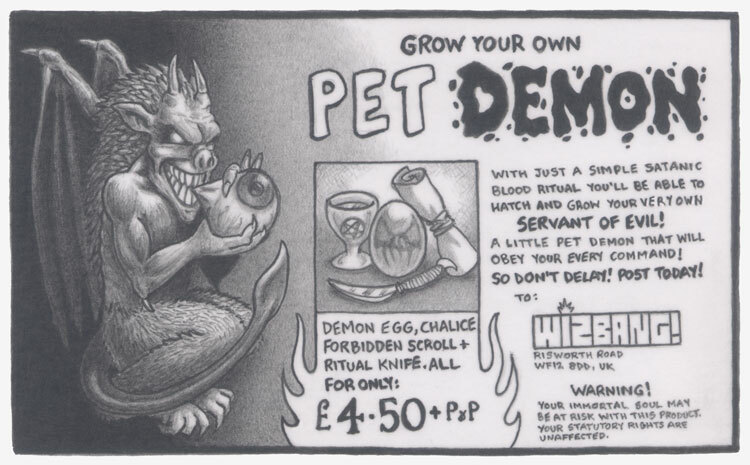 With these Wizbang ads, I decided to reference them with an advert selling everything you would need to grow your own little pet demon. A kit-form monstrosity that would probably sell well. Artwork labels: advert, art, comic book, demon, eyeball, mail order, pencil, pet, ritual, satanic, skav, wizbang, wizbang!